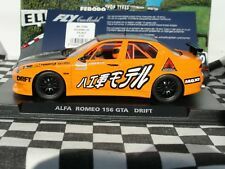 SCARCE BELLISIMO ALFA 156 GTA DRIFT. Scalextric C306 VINTAGE Alfa Romeo LOOKS LIKE IT HAS HAD VERY LITTLE USE! MMK NOW SOLD OUT. SCARCE RESIN MADE. "PERISCOPICA". CURSA MODELS. 1000KM NURBURGRING 1967. HISTORIC ALFA. ABOUT THE SLOTOUTLET CREDIT CARD. Fully Compatible with Scalextric and other 1/32 scale slot systems. SPECIAL EDITION AVAILABLE EXCLUSIVELY FROM THESLOTOUTLET. MMK SLOT CAR. ALFA WHITE RACE VERSION. ICONIC 60'S ALFA. 1:32 SCALE SLOT CAR. LIMITED EDITION - ONLY A SHORT RUN MADE. ONLY 20 MANUFACTURED. BEST PRICE AROUND. 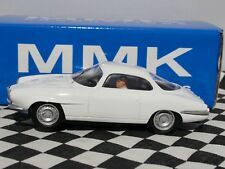 MMK SLOT CAR. ICONIC 60'S ALFA. 1:32 SCALE SLOT CAR. LIMITED EDITION - ONLY A SHORT RUN MADE. ONLY 20 MANUFACTURED. - Body resin, aluminum crown gear (screwed) and brass bearings and aluminum wheels (screwed). It's new in its factory sealed bag. It contains the chassis, front axle, front wheels and tyres along with screws. It's designed for model no. C2963 but I think it will fit them all. SKU: 19924 J. Its in Very good condition. It has Magnatraction. All DD Slots Cars are supplied Fully Tested and ready to race at Wallet Friendly Prices! Check out the DD Slots. “Spend a Little, Race a Lot!”. 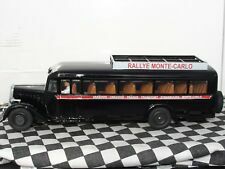 Scalextric C306 "Power & Glory" re issue Alfa Romeo LOOKS BRAND NEW UNRUN! HARD TO FIND NOW IN THIS CONDITION. MANUFACTURER REFERENCE: CA35B. FAST CLASSIC ALFA. SLOT IT SLOT CAR. 1:32 SCALE SLOT. ORANGE #27. BE DECISIVE - OR BE DISAPPOINTED. CREDIT CARD. NINCO, SCALEXTRIC, SCX AND CARRERA. MMK SLOT CAR. ICONIC 60'S ALFA. RTR HAND MADE RESIN CAR. - Body resin, aluminum crown gear (screwed) and brass bearings and aluminum wheels (screwed). 1:32 SCALE SLOT CAR. LIMITED EDITION - ONLY A SHORT RUN MADE. Wheels compatible with older models of Scalextric UK, France and Pink Kar Scalextric cars. 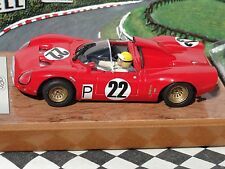 BRM - 1: 32 Scale. The set includes 5 precious alloy wheels BRM in 23 ". The outside ring and spokes are painted in red on the BRM factory. Hours of fun for the kids (and big kids) great for annoying the dog & cat. Possibly the most fun set that Scalextric ever made. Loop The Loop Micro Scalextric. SKU: P4312. This item is in Good Used condition. Credit / Debit Card. Micro Scalextric Alfa Romeo 155 Race Car. Infinity Red Bull Racing "Camo Bull test car 2015". The car is new, never used and original boxed. Suitable for Carrera digital 132 and compatible for Carrera evolution as well. Only 1.999 pieces worldwide. THEY RUN GREAT. Gender Boys. SKU: 20417 J. This has only really slight marks. Check out the DD Slots. “Spend a Little, Race a Lot!”. Credit / Debit Card.